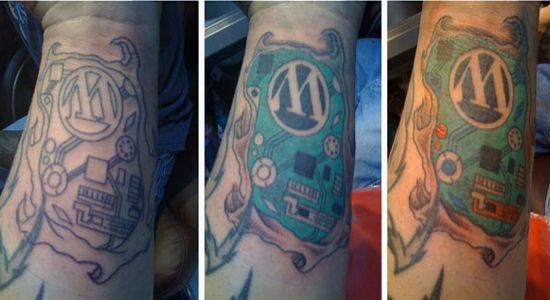 Ed Morita is a geeky nerd and a tattoo fanatic who got WordPress logo inked on his forearm. As yâall can see, its not that dull boring kinda logo tat, there are all sorts of things happening like wires and circuits with âWâ as the centerpiece. I simply loved the tat and surely all you geeky nerds out there would adore it too. ← Scorpio and Libra pictogram tattoo!